Looking outward instead of inward gives relief: “It’s not my fault.” What a burden can be lifted! The dog ate my homework. She started it. Bad leaders incited their innocent followers. Everyone else does it. 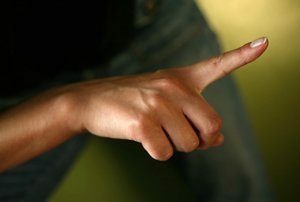 Finger pointing is fluid, however, and counter blame along with denial arises quickly in response to blaming. It wasn’t me that started it – it was him. The parents have spoiled that child. He was drunk. I didn’t know what was happening. I just was following orders. Voices in my head told me to do it. And then around it can go back to guilt and shame as well as more counter blame. You should have known better. I saw you do it. Violent video games effected his brain. It was his genes that made him do it. Thus you can see that guilt, shame, and blame can start on a cycle that gathers dark energy. So, there are two parts to look at – first, society — All human societies, in order to function, must have a system to deal with violations of their values. Fault-finding is taken out of the hands of those who feel wronged, or those who think society is not addressing wrongs, to curb on the one hand martyrdom and on the other scapegoating, vigilante and mob justice and its subsequent climate of bullying, to move to the (ideally) rational processes of investigation, debating the evidence, assigning responsibility and deciding on the consequences. Part of this process involves determining which members of society are not capable of taking responsibility for their actions: for example, children and those assessed to be mentally ill. These deliberations can be nuanced and complex. In the most obvious cases, society is responsible for protecting its citizens from those who would continue to do harm. It is on the frontiers of human societies that processes have not yet been put in place, the innocent are not protected and harm is not anticipated. We are all, in a sense, now living in a new frontier: a technological one. We have still not developed our values around the use of the internet for social interaction. Of course, there are many things that happen that are truly accidents, or acts of nature, that no blame can be assigned to directly. (who can you blame for a volcano erupting?). The focus then can shift to blaming those who did not anticipate the event: their failure to warn and protect the people. Sometimes assigning blame can give no peace, in spite of the ideals of restorative justice. Sometimes the villain is never found. Sometimes there is no one to blame. Dr. Neufeld and Dr. MacNamara, in talking about the Vancouver riots of June 2011, have analyzed the factors that can cause blameworthy acts and show how, tragically, the justice system cannot teach those who most need to learn from experience and are likely to get into trouble. Do you say in response to these editorials, that society itself is to blame? Or parents? Can you look at the tragedy without assigning fault? The second part – the individual — The energy of blame is tremendous. What fuels the intensity of it? What fuels the desire for punishment and revenge in the human heart? What drives that righteous rage which makes us lose compassion? What causes it to cycle back viciously into overwhelming guilt and shame? Those who are hardened and cannot register vulnerable feelings tend towards blame. Guilt and shame are the more vulnerable of the three feelings. Those who are more ‘civilized’ you might say tend towards feeling guilt. In some cases this can spiral down into black depression. The driver is of this energy is a deeper feeling in the emotional brain – this emotion can build up and if not drained is like the lava that causes the volcano to erupt. This is not something to control by clamping down on it…the pressure just continues to build. This emotion is quite simple to understand – it is also the emotion that gives rise to guilt and shame in those who are more likely to take responsibility for their actions. What is it? How does frustration differ from anger? We often say that someone has a lot of anger in them when what we mean is that they are full of foul frustration. Anger is rational response to perceived injustice and belongs to the previous section of this discussion. It finds fault. Certainly one can experience both simultaneously, but in order to address underlying dynamics, they must be teased apart. To address frustration is to find a way into a situation that does not require fault finding. To think about frustration: when something doesn’t work, the first impulse is usually to try to effect change, and if no change is possible, to face the fact that this route is futile. When for some reason, futility does not register, then a person is loaded up with the frustration, which usually erupts into aggression when something overrides any cautions that may be present. The desire for vengeance is driven by frustration in its aggression mode. How to deal with aggression? One approach is to find socially acceptable modes of aggression. Ultimately, the goal is to find a way to drain this frustration out of the system. This only comes with the true registering of futility: the outward sign of this is tears, although we can feel our tears inside without much showing except a little watering in the eyes. In conclusion — The question that I conclude with – how can the justice system, which is for the good of society, and often sacrifices the individual (especially our children and adolescents), and the no-fault approach, which puts aside the justice system for the sake of the individual… how can we reconcile these two things? The answers lie, largely, in insight, so that societies and the individuals’ interventions and changes are coming from understanding of root causes and are not engaged in fighting symptoms. Editor’s note: Dr. Neufeld unpacks the roots of Aggression in his DVD, Making Sense of Aggression, and addresses the challenge of dealing with children’s misdemeanors in Making Sense of Discipline.